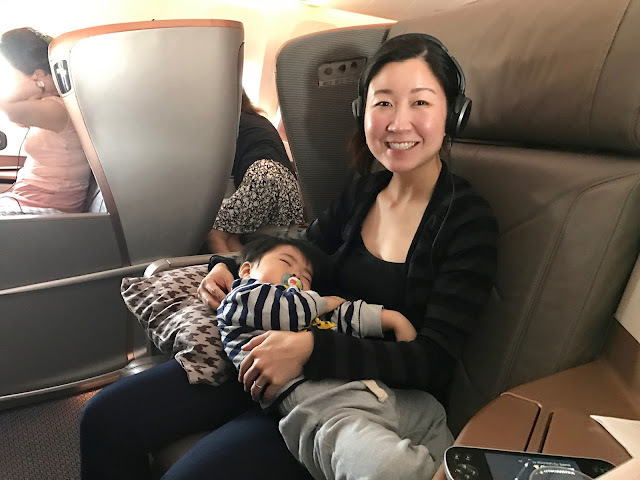 On March 16th, my family boarded the Singapore Airlines Boeing 777-300ER aircraft bound for Tokyo (NRT) from Los Angeles (LAX). We got to experience the Singapore Airlines new upgraded business class. 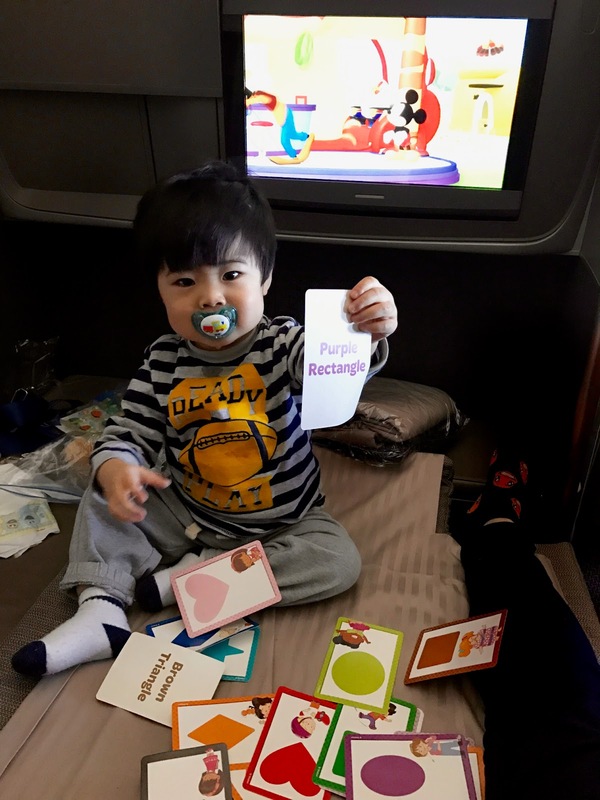 This was our son’s first international flight and we figured Business Class was the way to go! We were on the waitlist for First Class but unfortunately no availability opened up. We still had an amazing experience from flight check in to departing the plane. Checking in at the airport was a breeze. We arrived at the airport early for our 10:15am flight because we didn’t want to deal with traffic. Since we arrived to the LAX airport early, we didn’t have to deal with crowds of passengers lining up to check into their flight. That being said, even if we were late, Singapore Airlines offered a dedicated First Class and Business Class flight check-in line. After dropping off our luggage, we got to pass through the “family line” for shorter processing time through security. Next we headed towards the Star Alliance lounge on the 6th floor. This lounge was extremely large, clean and quiet. Having First or Business class tickets automatically grants you entrance into the lounge (if you’re flying economy, you can access the lounge with Priority Pass). Espresso machine ground us fresh coffee to start our day. This lounge was a great place to enjoy breakfast. We scarfed down some tasty scrambled eggs, turkey bacon, pork sausage, chicken congee, and Vietnamese noodle soup. This lounge even offered shower suites! My family found a quiet room where we could enjoy some privacy and enjoy our breakfast. Lounges make arriving at the airport early a fun part of our trip. As soon as we got to our gate, attendants came to take our stroller onto the plane. First and Business Class passengers get to board the plane first. We walked past the First Class seating area towards our Business Class seats (11D and 11F) and what I noticed was that Business Class looked surprisingly like First Class. There weren’t many stark differences; the television displays were slightly larger and the length of the First Class seats was longer – that was about it. Being seated in Business Class felt very much like being in First Class. Once we boarded, we were immediately offered Charles Heidsieck Brut Reserve champagne and freshly squeezed orange juice. We were also given some fresh warm nuts. 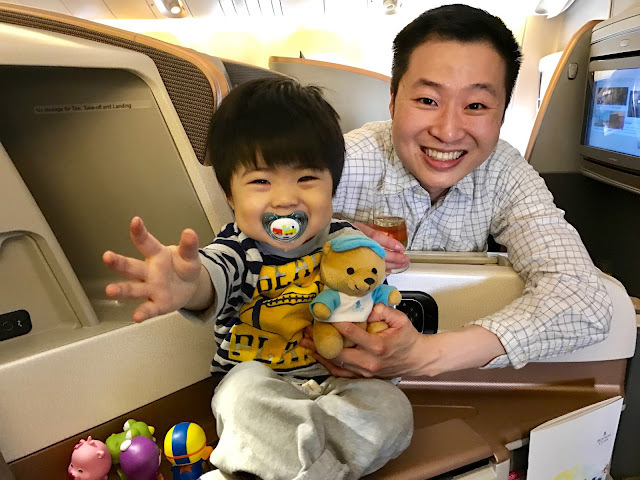 A stewardess gave our son a stuffed Singapore Airlines bear! The Business Class seats had supple Scottish leather with diamond stitching for a very classy look. The seats were quite wide and spacious. 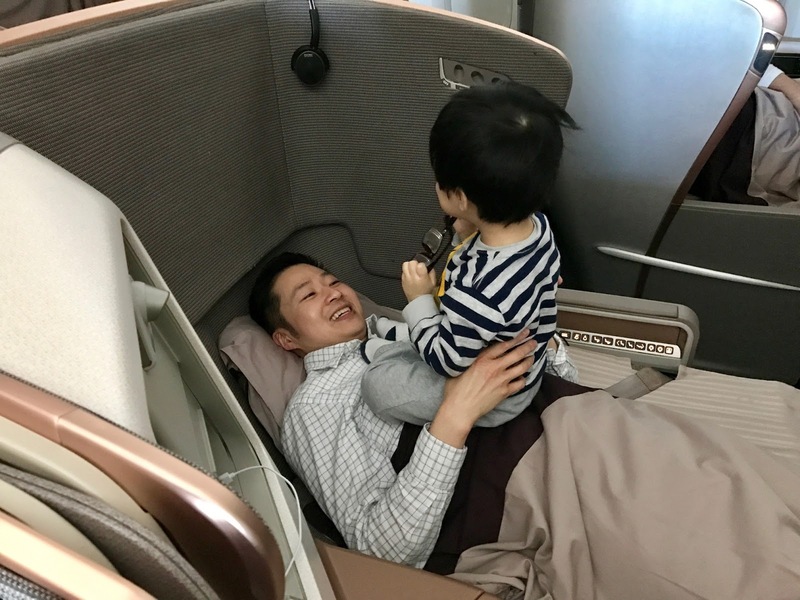 I believe they are the widest Business Class of any airline. I would say these Singapore Airlines Business class seats were very comparable to our First Class seats on Cathay Pacific. I loved the fact that there were ports for USB and power supply so that I could charge all of my electronic devices. Our son loved exploring his seat. There were so many different buttons and light switches for him to explore. He kept playing with the touch screen remote control. He made himself comfortable on the shelf / armrest by treating it like his seat. We brought along several toys for him to keep him occupied during his flight. 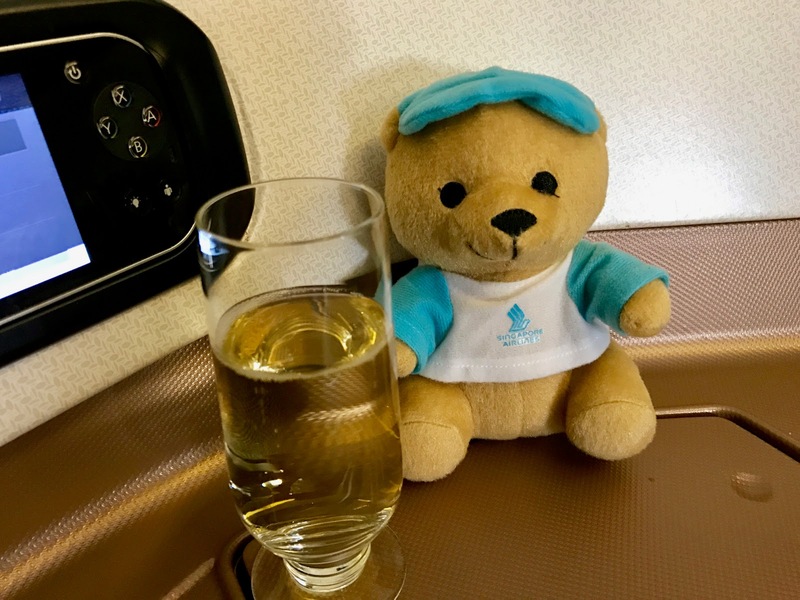 In First Class we had a dedicated stewardess taking care of us; in Business Class we had a whole team dedicated to keeping everyone comfortable and happy. Another difference was that on our last First Class flight, there were only 6 seats in the cabin. On this section of our Business Class flight there were 3 staggered rows of 4 seats for a total of 12 seats. Lastly, in Business Class you don't get to take home a souvenir pajama outfit and toiletries. No big deal. You do get to keep some slippers, which is a nice touch. As our boy laid down for his nap, I looked through the extensive list of movies available and choose to watch Arrival. It was a movie that I haven't had the chance to watch yet. We were provided a nice set of noise cancellation headphones so we could properly enjoy the in flight entertainment. Flight attendants then came over and confirmed my Book the Cook order of seared Chilean bass for brunch. 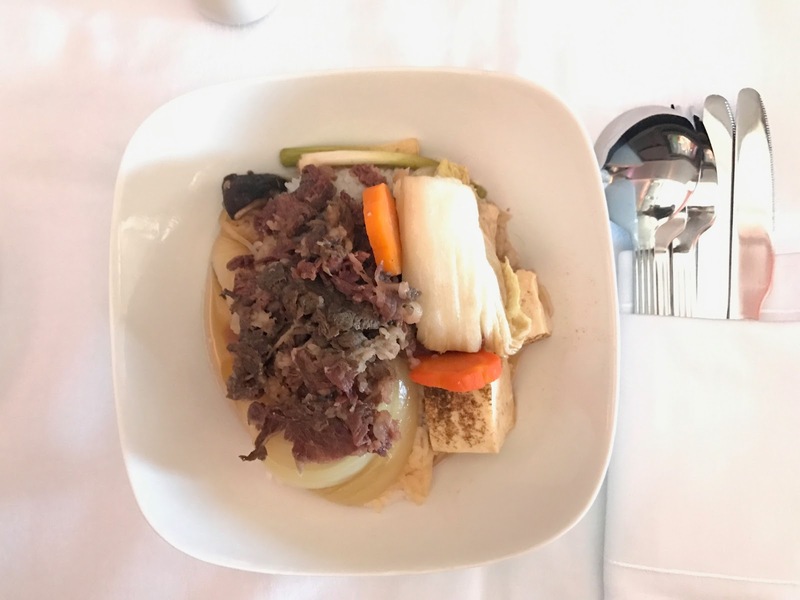 Singapore Airlines Suites, First, and Business Class offer unique menu options that you can reserve up to 24 hours prior to your flight. Breakfast started off with an assortment of breads and fruit plate with tea. I loved having the white cloth draped over the table. 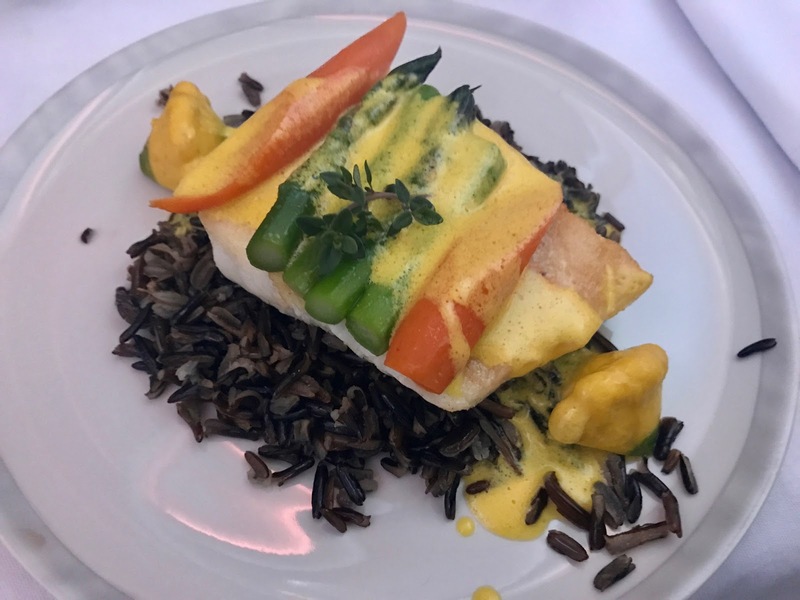 For brunch, I had the seared Chilean bass with creamy saffron sauce, baby vegetables and wild rice. The fish was very flaky and delicious. My wife enjoyed the beef sukiyaki with rice. She really enjoyed the sweet and salty flavors. For dessert, we had Ben & Jerry's Strawberry Cheesecake ice cream. All of the flight attendants were extremely attentive and accommodating throughout our 11 hour 45 minute flight. It felt like we were in a fine dining establishment. My glass was always filled with champagne. When we walked towards the bathroom, someone would make sure it was not occupied, and then open the bathroom door for us. What a nice touch. Inside the bathroom was a drawer full of basic amenities such as toothbrush, toothpaste, shaver, and hairbrush. When it was time for me to get some rest, a stewardess came to flip my seat headrest down to convert it into a completely flat sky bed. I am about 5'10" tall and could not extend my feet completely without hitting the end of the seat. To achieve maximal comfort, I angled my body slightly towards the side to gain a couple of extra inches of legroom. Comfortable sleep came quickly. The fully flat bed turned into a fun little play area for my son to play with his toys, stickers, and flash cards. He had plenty of room to stretch out and roll around. I can’t imagine being cramped up in economy with this rambunctious little fellow. Next movie up: Ant Man. Final movie I started but didn't get a chance to finish until our flight home was Jack Reacher: Never Go Back. For lunch, we started off with the parma ham with mozzarella cheese, tomato, arugula lettuce and balsamic dressing. My iPhone camera doesn't take the best pictures in low light. 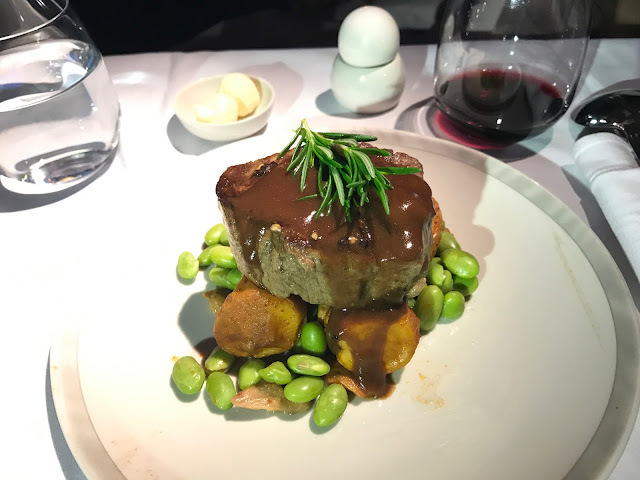 Then I had the peppered filet mignon with mustard jus, chanterelle mushrooms, fava beans, and paprika red potatoes. The meat was tender and tasty. I paired my meal with a fruitful 2013 Robert Oatley Shiraz from Australia. My wife enjoyed her Chilean bass. Shortly after our lunch, our plane began to descend into Tokyo, Japan. We had an excellent time eating delicious food, drinking champagne and wine, watching movies and getting restful sleep. 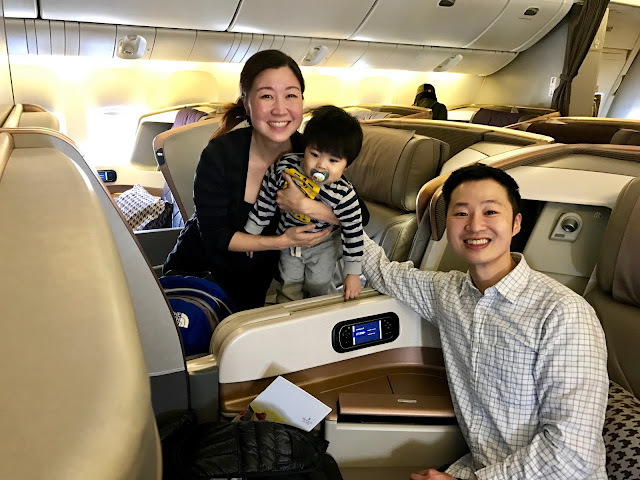 Singapore Airlines Krisflyer miles can be transferred from Chase, American Express, Citibank, and Starwood Preferred Guest. This flight cost us 65,875 miles each person; totally worth it for us! Total cost of round trip Business Class flights for both of us came out to 263,500 miles. Taxes and fuel charges for the both of us totaled $46.80 to Japan and $122.46 to fly home. We had to pay 10% adult fare for our son's ticket, which cost $432.66 for round trip (children younger than 2 years old pay 10% adult fare). Total cash spent on round trip flights for the 3 of us was $601.92. It was a great start to our 2 week vacation. I'll write about our return flight in another post. Airlines miles help us live a rich life as we continue to save and invest towards our financial freedom.